Franklin-Monroe’s Jacob Aslinger attempts a putt during the Jets dual match with Mississinawa Valley on Tuesday at Turtle Creek Golf Course. Aslinger was the medalist with a 45 as FM won the match on a tiebreaker score. Franklin-Monroe’s Austin Wolfe hits this tee shot on Tuesday during a dual match with Mississinawa Valley at Turtle Creek Golf Course. Mississinawa Valley’s Justin Miller makes a chip shot onto the green on Tuesday during the Blackhawks match with host Franklin-Monroe at Turtle Creek Golf Course. Miller shot a 49 to lead the Blackhawks in a losing effort. Mississinawa Valley’s Mattie Hiestand putts on the green during a dual match with Franklin-Monroe on Tuesday at Turtle Creek Golf Course. FM won the match. 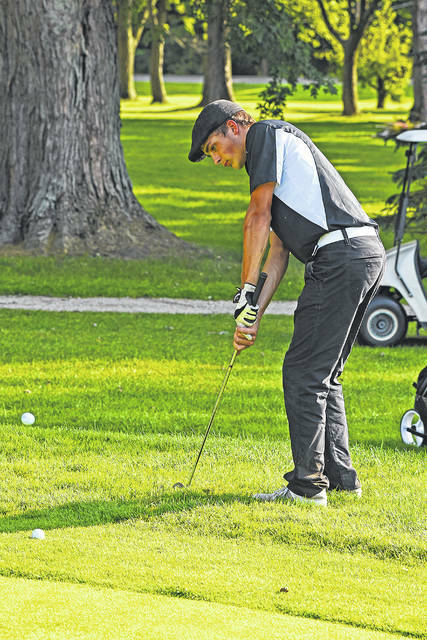 UNION CITY – Mississinawa Valley boys golf team took on Franklin-Monroe in a dual golf match Tuesday evening. Both teams have similar stories – young and inexperienced, but growing and getting better. 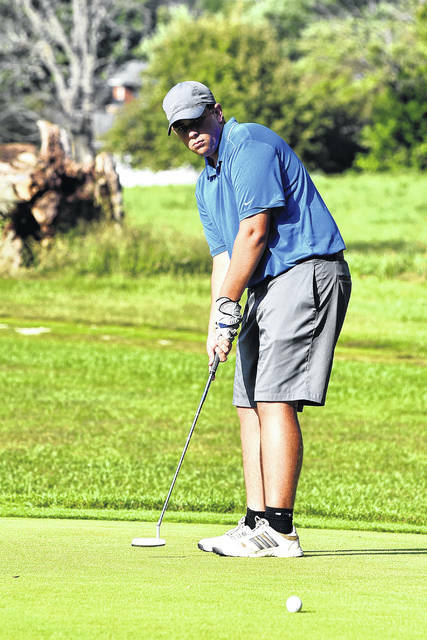 Last year the Franklin Monroe boys golf team qualified to advance to the OHSAA district tournament with three seniors, but two of the golfers on that team were the fourth and fifth golfers and have been the most consistent for the Jets this year. They are senior Jacob Aslinger and junior Austin Wolfe. Aslinger has been golfing in the one spot, Wolfe in the two spot and after that it’s been a little bit of struggle. Dalton Goubeaux, who was also in the mix last year, has been hurt most of this year and would normally be in the three spot. “We’ve been up and down this year. We’ve won a couple of matches at home, but struggled away from the Turtle, FM’s home course,” FM boys golf coach Andy Zimmerman said. “We have just one senior and a bunch of young kids so we’re learning, and we struggle going back and forth playing on different courses, we are trying to figure things out a little bit and I see a lot of improvement, that is golf,” Zimmerman added. Mississinawa Valley also is inexperienced and very young with five boys and two girls on the team. Justin Miller is the lone returning player from last year and the senior leader for the team playing in the one spot. The number two golfer is Zach Longfellow a junior, his first-year golfing. The number three is Dalton Brim, a sophomore and his first year out. Kaedon Stewart is a freshman and junior Mason Hardwick are in the four and five spots and both first-year players as well. Addison Spitler and Mattie Hiestand round out the team. “Every match we seem to keep getting better and with that gaining experience, which is very much needed with a team this young. 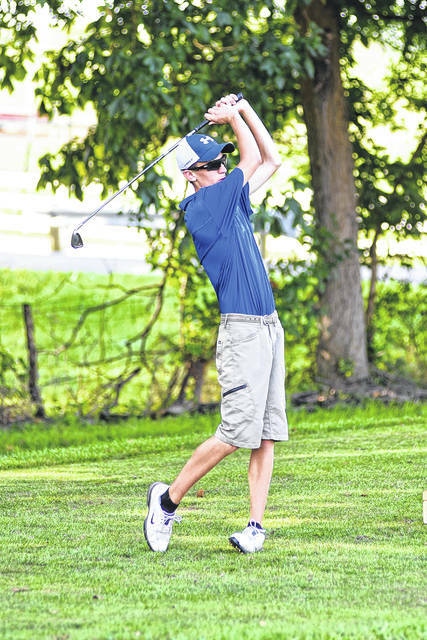 We won our first match last Thursday against Bradford so it’s nice to see the kids get a win,” Mississinawa Valley boys golf coach Max Kindell said. The Hawks nearly pulled off a second win when they ended up deadlocked with Franklin Monroe with each team registering a team score of 230. But the Jets edged out Mississinawa on a tiebreaker with Chase Osterday edging out Mason Hardwick. Jacob Aslinger of FM was the medalist with a 45 and Justin Miller was the low man for Mississinawa with a 49. “Tonight was a great teaching opportunity and proved to our team that every player is important every night. You never know when you are going to need that fifth or sixth score to take a match and tonight it went in our favor,” Zimmerman stated. The win improved the Jets to 3-4 in the league and they will travel to Miami East on Thursday, while the Hawks dropped to 1-6 in the Cross County Conference and will travel to Covington on Thursday. This entry was tagged CCC, Franklin-Monroe Jets, Mississinawa Valley Blackhawks, Turtle Creek Golf Course. Bookmark the permalink.